This B&H Kit pairs the DJI Ronin-S Handheld Gimbal Stabilizer with the compact, stackable Nanuk 923 Hard Case for the Ronin-S. The Ronin-S supports up to 8 lb and has an angled motor arm that allows for unobstructed screen visibility. Some features of the gimbal include direct camera control using supplied cables, follow focus control with the integrated focus wheel (optional motor required), and automated creative functions, such as repeatable tracking movement, assignable via the accompanying iOS/Android app. The Nanuk case comes with a custom foam that supports the Ronin-S and its accessories. The case has a waterproof, dustproof, and impact-resistant design among its many other advanced features. A Focus Wheel is included for pulling focus with select camera systems with compatible lenses, or with a separately available focus motor. It attaches right to the side of the unit for seamless integration and a unified appearance. 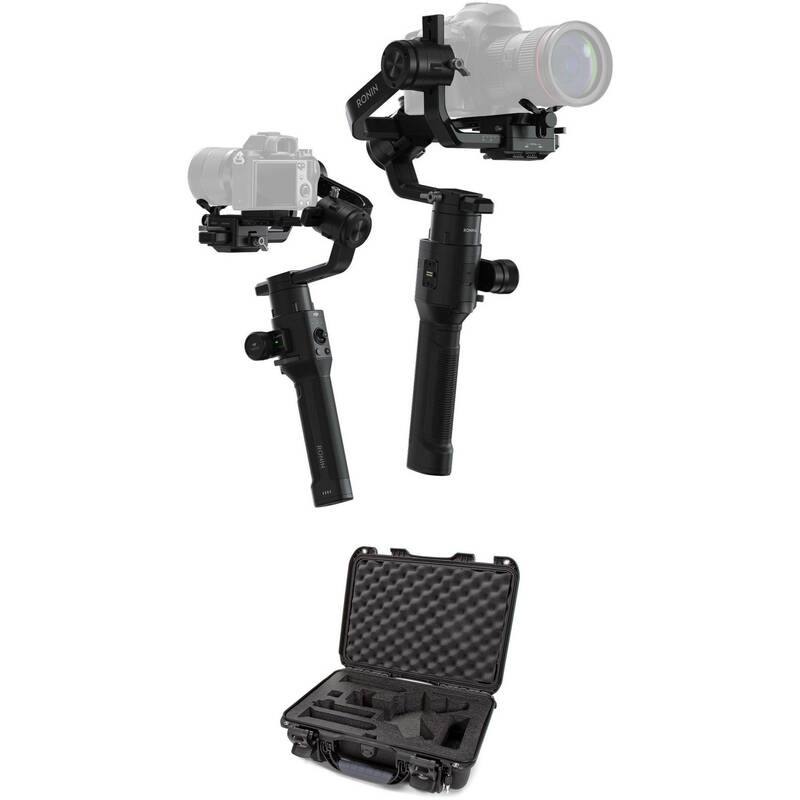 Multiple accessory mounts are allocated on the Ronin-S, providing full support for add-ons such as a microphone, LED light, or a wireless video transmitter. Compatibility with DJI control devices such as Master Force provides intuitive controls. The Master Wheels are also able to provide remote operators precise gimbal movements. Keep your DJI Ronin-S gimbal snug and safe with this black 923 Case from Nanuk. Featuring a custom-cut foam insert, this case ensures all your gimbal's delicate parts remain in place and properly organized. The Nanuk 923 boasts a tough yet lightweight NK-7 resin shell, a PowerClaw latching system, and a waterproof design. Rubber feet provide a secure grip while two standard TSA locking latches protect your Ronin-S and accessories during your travels. The spring-loaded handle retracts when not in use and the reinforced padlock eyelets add another layer of protection for your gear. Box Dimensions (LxWxH) 18.9 x 15.2 x 6.8"
Ronin-S & Nanuk 923 Hard Case Kit is rated 4.2 out of 5 by 210. Rated 2 out of 5 by m c. from Defective plate mechanism Today I received my long awaited Dji Ronin-S just to receive a defective item. The problem that I am having is with the plate lock mechanism, it locks but it does not unlock. The locking mechanism gets stuck and because of it, I was not able to calibrate (balance) the camera. You simply can't make any adjustments once it locks, the plate does not free up when the lever is pulled back to the unlocked position. I would like to know if this is something other people are experiencing. As of now I am exchanging the product, once I get a new unit and are able to make it work will update review. Otherwise, be on the lookout for similar problem. Rated 1 out of 5 by Roger from Product Solid, but with battery failure. I am very disappointed with the DJI brand, I bought the product two months ago, I waited 3 weeks for it to reach my hands. After arriving, I tried it and it worked, it is something complicated to calibrate but not impossible, I like the design of the product, it feels solid. After using it 1 time, I put it in its box and after 3 weeks, I take it out again and it does not work, I connect the cable to charge the battery and it does not work. I tried another cable and it does not work either. I already contacted DJI support but they do not answer yet. I hope you have a solution. But soon the battery does not work. I was very excited to use it this weekend in an event but this time DJI failed. Rated 3 out of 5 by Richard from A bit of a beast.... Haven't had it for very long but have used it a few times now. First thing is it's a beast. If you're not someone who is a bit stronger, don't get one. I'm a big guy and I can handle it but, someone smaller will struggle with it--especially on longer shoots. I hate the case it comes in. DJI has a long history of providing horrible cases. You have to take the whole gimbal out of balance to fit into the case. Annoying to be sure. Thankfully, balancing isn't all that hard but it would be nice to be able to put it into the case without ruining the balance of it. Definitely well-made and sturdy. Feels like a quality product. Just very heavy for a gimbal like this. Rated 1 out of 5 by Dillon K. from Nikon Incompatible Based on DJI's website, it shows a list of compatible Nikon Cameras, including the D500 listed as "Start/stop recording video Capture photo Pull focus (with supported lenses) Adjust camera parameters" However, as soon as you connect the cable from the ronin S to the Camera, the live view shuts off and the camera becomes a brick. The gimbal also shuts down completely. The following is a response from a DJI RnD Engineer on the DJI ronin forum "When plugging a USB cable into a Nikon camera, some of them turn off live view. This is a Nikon issue and nothing DJI can do." -DJI Paul DJI should not be advertising that the cameras are compatible when they actually arent. Rated 1 out of 5 by Couper from 50% failure rate for us Bought two. One died the first day and is on the way back to DJI. The other is decent, on par with the Zhiyun Crane 2. Maybe a touch better. On the other hand we've had 5x of the Crane 2 since they shipped and not had a single failure. That would push me to buy the Crane 2 instead of these easily. Quality control may get better from DJI with updates of these... but for now I'd pass on this. Rated 1 out of 5 by Michael from DJI Customer Support Is Horrible - Ronin S is Great. I purchased my Ronin S, expecting a very good product, which I did get, however, I had an issue out of the box. I decided to contact DJI and they said they would replace it with a new unit since I had purchased it within the last 15 days. I mailed it to them, they held it for about 2 weeks trying to convince me there was no issue, finally they broke down and said they would send me a new replacement. The so called replacement comes in the mail and it is a refurbished and/or 2nd hand unit from who knows where. I really dont understand how I paid for a brand new unit, only to get a used one which I couldve gotten anywhere else but B&H. BEWARE of DJI customer service, its as bad as everyone claims. Ronin S - Great B&H Support - Great *Note: B&H goes through a 3rd party to replace DJI products, this is also a little odd. Rated 1 out of 5 by van from Nikon users beware! DJI claims the ronin-s works with Nikon cameras. It does NOT when plugging your cable from the ronin to your nikon camera it locks the camera up and the gimbal loses power. When the gimbal goes limp it then causes your lens to crash into the gimbal. I have called DJI support several time and they blame Nikon. I contacted Nikon and they had no knowledge of the issue. The gimbal works great other than this HUGE issue. DJI needs to update the spec sheet and remove Nikon from supported cameras! Wait 6 months or a year and let them get the bugs worked out. At this point a WASTE OF MONEY FOR NIKON USERS! Rated 5 out of 5 by Brejnev from Loving it!... almost thought I had to return it tho!!! So excited when I first got it today. Charged it up for about 30 min just to try it out. I turned on the battery, turned on the gimbal , heard the "beep"... and NOTHING happened.. Motors didn't do a thing. I thought I had a lemon straight out of the box. The mode 1 led was dimly flashing on and off.. come to realize that it was in a standby mode.. double clicked the power buttons and motors came alive!!.. Thank GOD!! Gonna have to work out more cuz geez!!!.. this thing isn't light!.. other than that, I'm in gimbal heaven!! Can't wait to shoot with it! The USB-C connection on this, is it able to carry video or is it just a replacement for a regular usb-3.1 connection? Since not all USB-C are the same it is important to know exactly which it is. The USB-C connection on the Ronin-S is not for video. Does it work with Nikon Z7? does it work with Leica Q? It can easily handle it weight wise. The included USB cable should work as well. Will it work with a fuji xt-3? Yes, you can mount the Fuji X-T3 on the Ronin -S. The necessary cable, a USB-C Camera Control Cable, is in the box. Is there enough forward-backward adjustability to balance an EOS r with a massive 3 lb RF 28-70 f/2 and still have enough room for full movement? Shipping weight and dimensions for the entire combo? Thanks!!! This is a B&amp;H Kit, the products will come in their own boxes. The DJI Ronin-S is packed in a box that is 13.5 x 7 x 6.5 Inches and weighs 8.5 pounds. While the case is 18.9 x 15.2 x 6.8 and weighs 7.8 pounds. Is this fully (focus) compatible with the Canon T6s/T6i? While you will be able to balance and shoot with cameras like the Canon T6s and T6i on the Ronin-S, they are not listed as compatible for full electronic control through the gimbal. Does anyone know if the Ronins follow focus and start/stop button will work on a Panasonic LUMIX FZ2500? The Lumix FZ2500 is not on DJI's list of compatible cameras for those specific functions with the Ronin--S. However you will be able to balance and shoot with that camera on this gimbal.